Abidjan International Airport is the largest airport in Ivory Coast. Its international code (IATA Code) is ABJ. This is the one on your luggage labels when you take a flight to Ivory Coast. It was renamed Felix Houphouet-Boigny International Airport after the father of Ivory Coast Independence and first President of the Republic (photo). It's one of the fastest growing airports in Africa: it ranks in terms of number of passengers at the forefront of WAEMU airports, the second largest (after Johannesburg) of subsaharian african airports. Its terminal is set in the township of Port-Bouët and its tracks occupy a large part of South East Abidjan. A fast lane, Giscard d'Estaing Boulevard, allows to quickly reach the Ivorian capital. The reception of departing and arriving travelers makes of Abidjan International Airport one of the nicest airports in West Africa. Accessible sanitary facilities, shops, parking, bars and air-conditioned halls allow passengers to wait for their flight in the best conditions. 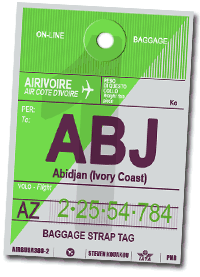 With a flight punctuality greater than 90%, Abidjan International Airport will guarantee a seamless aerial experience !